MIDLAND PARK. N.J. — November 8, 2011 — Taking its role as a landscape designer to a statewide level, Jacobsen Landscape Design and Construction worked in conjunction with the Commerce & Industry Association of New Jersey (CIANJ) to design and decorate the stage for a business and commerce speech by Gov. Chris Christie earlier this month. The occasion was the 84th Annual Meeting and Luncheon of Commerce & Industry Association of New Jersey at the Hilton Woodcliff Lake in Woodcliff Lake, N.J. on Oct. 28. Gov. 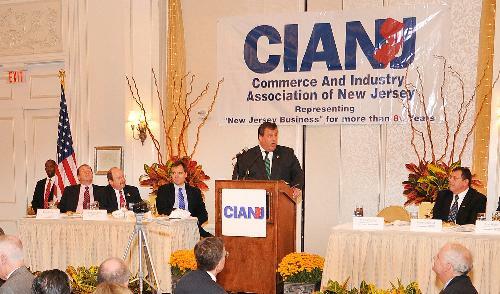 Christie was the keynote speaker in front of more than 450 CIANJ members from around New Jersey. When he took the dais, Gov. 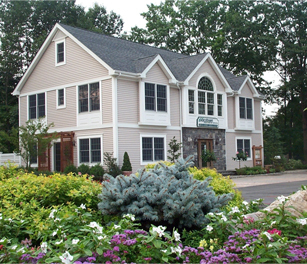 Christie was framed by an elegant floral design provided by Jacobsen Landscape designers in conjunction with the Raimondi Horticultural Group. The display consisted of a mixture of ornamental peppers, crotons and painted willow branches, which allowed Jacobsen Landscape to present the vivid colors of fall and provide a tasteful seasonal backdrop to the governor’s speech. Gov. Christie said that there is a new optimism in the Garden State as he delivered the keynote speech at the luncheon. CIANJ's Annual Meeting & Luncheon serves as a?forum through which business leaders gain insights into current trends and opportunities on the horizon, while renewing longstanding professional relationships and initiating new ones.